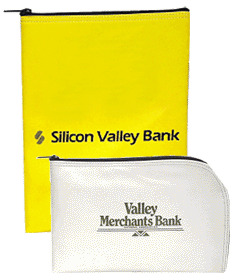 Zipper wallets are used as deposit bags for banks or handy pouches for businesses. Holds bank transactions, petty cash, checks, paperwork, office supplies, keys, employee belongings, etc. Popular among banks, retailers, schools, and more. Many fabric and color choices available. Color coding increases work efficiency. Silk screen imprint included (one color/one side). Standard or custom ink colors available to match your corporate logo.